Heating and lighting bills continue to rise with higher than inflationary increases in unit prices from the UK’s “Big Six” energy providers over the past few years. Although the Government has slightly reduced the subsidies for renewable investments the average bill is now double than it was seven years ago. Although the winter months are the most expensive you should check you’re on the right tariff two or three times a year. To check current availability all you need is the postcode of your premises and meter number for businesses. What’s Available for my Home? A vast range of variable and fixed rate tariffs are available. Ofgem have attempted to simplify residential tariffs and cut down the options available. Generally for each supplier you’ll be presented with one standard variable tariff, a longer term fixed rate deal and a capped rate. Compare your home postcode online at least twice per year. Select either a discounted or fixed rate term from the lowest provider. Complete your details and you’ll be transferred automatically in two weeks. Paying monthly by direct debit reduces prices between 4% and 10% depending on the supplier. If you have a pre-payment or coin operated meter try and change this for a regular smart meter to enable you to select lower options. What Process Should I Follow for my Business? In the majority of cases businesses have to select a fixed priced contract for at least one year. Longer terms are available with a price premium and variable pricing is being introduced shortly. Terminate your contract at least eight weeks before the end date. Use a broker or comparison site to find a new contract term. Sign the new agreement and the switch will occur on the anniversary date. Complete our quote form online or call us on 0800 566 8776 for details. Be aware that extremely high rates are applicable if you do not renew a terminated contract. What Supplier is Best for Me? Regional differences apply around the UK based largely on the market before deregulation. A contract from one supplier can be cheaper in London than Birmingham for the same property. 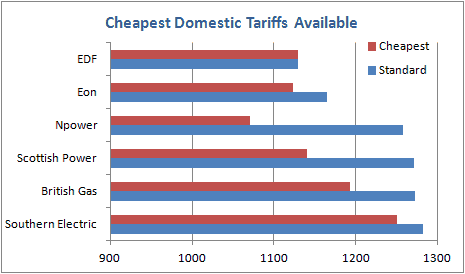 The average electricity bill for all regions is shown in the graphic below. The providers in the UK include: British Gas, Cooperative energy, Dual Energy, E.ON, Ebico, Ecotricity. EDF Energy, First Utility (now Shell), Gazprom, GDF Suez, Good Energy, Green Energy, LoCO2, Marks and Spencer, npower, Opus, Ovo, Power NI, Sainsburys, Scottish Power, Spark Energy, Scottish and Southern, Total Gas & Power, Utilita, and The Utility Warehouse.